In Kingdom Hearts 3, players join Sora, Donald Duck, and Goofy on their latest quest to save the universe, which sees them hop from world to world, visiting familiar locations (for series fans) as well as some that are completely new. 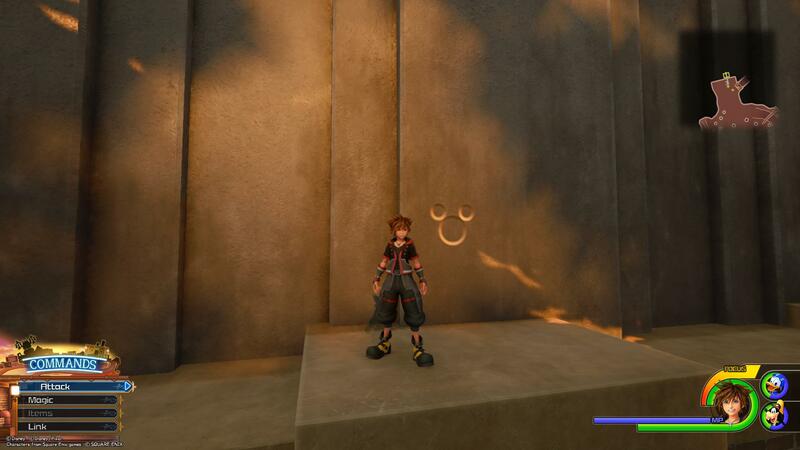 Along the way, players can take pictures of Lucky Emblems, or hidden mickey symbols, scattered throughout the worlds in order to receive in-game prizes. 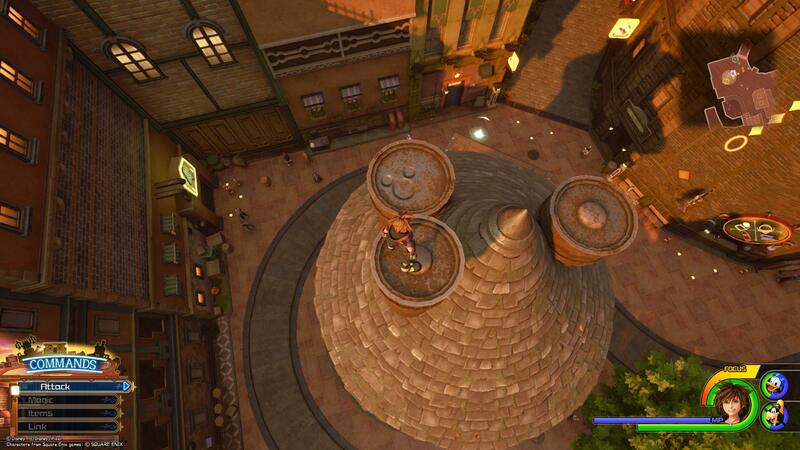 One of the first worlds players visit is Twilight Town, which has nine different Lucky Emblems to photograph. 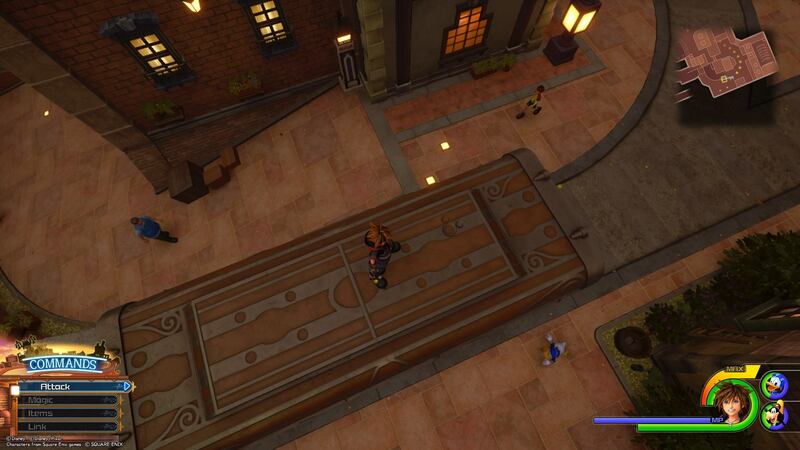 Check out the video below to see the locations of all nine Lucky Emblems in Twilight Town, or keep reading to see a picture and description that will help you find each one. 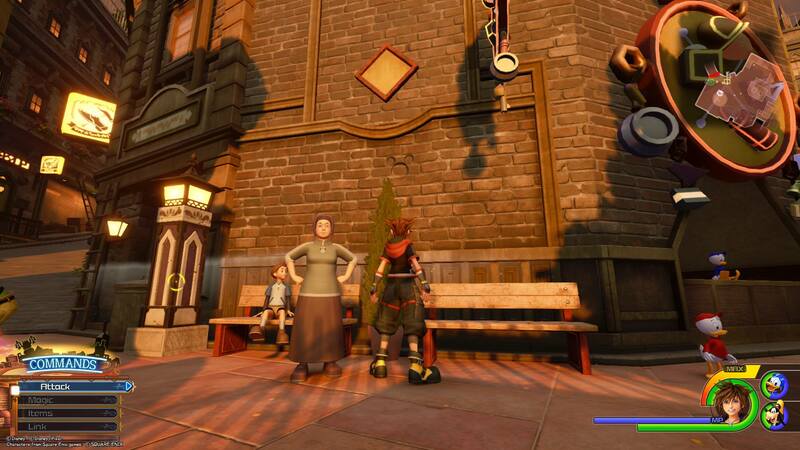 Diagonally across from the Tram Common save point, you’ll see a woman standing next to a child sitting on a bench. The first Lucky Emblem is on the brick wall behind the woman. After photographing the first Lucky Emblem, turn around and run up the wall of the Moogle Shop (the round building) to the roof. Climb on top of the tallest of the three chimneys and look down. You’ll spot the Lucky Emblem on top of another chimney. 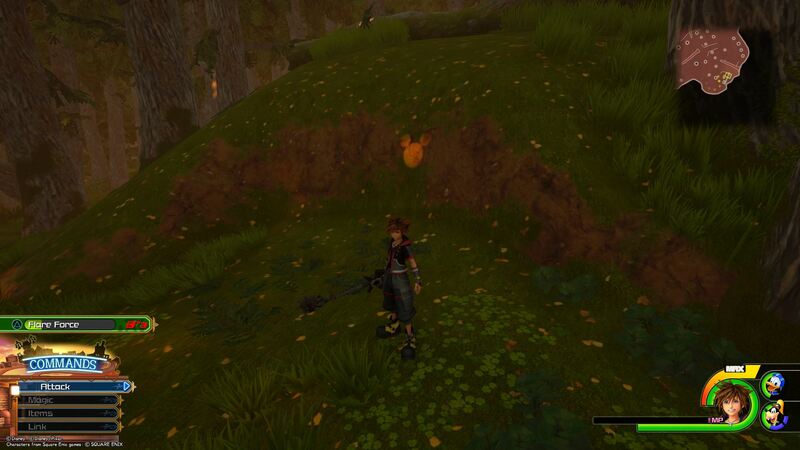 From the Moogle Shop, climb one of the central buildings in the middle of the Tram Common. From there, look for a table and two chairs sitting on one of the building’s roofs. There are three plates on the table that form the Lucky Emblem. From Lucky Emblem No. 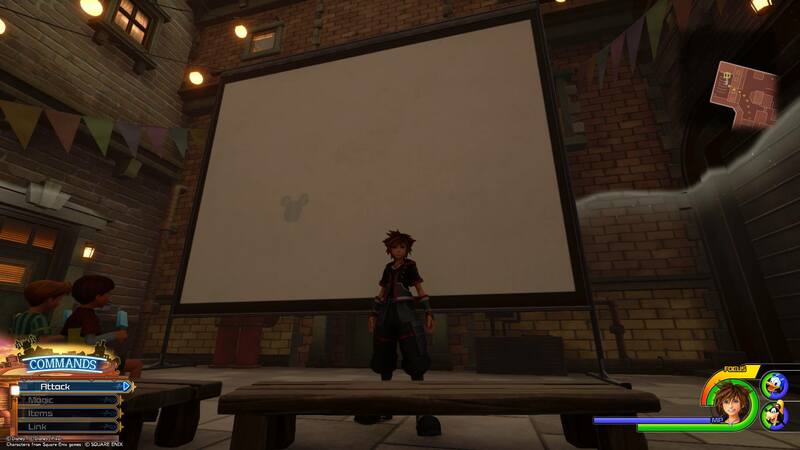 3, go back down to street level and make your way down a nearby alley into the area where a movie starring Sora and Mickey Mouse is playing on a large white screen. Wait for the film to finish, and a Lucky Emblem will appear on the screen for you to photograph. Locate the trolley that travels around the Tram Common. 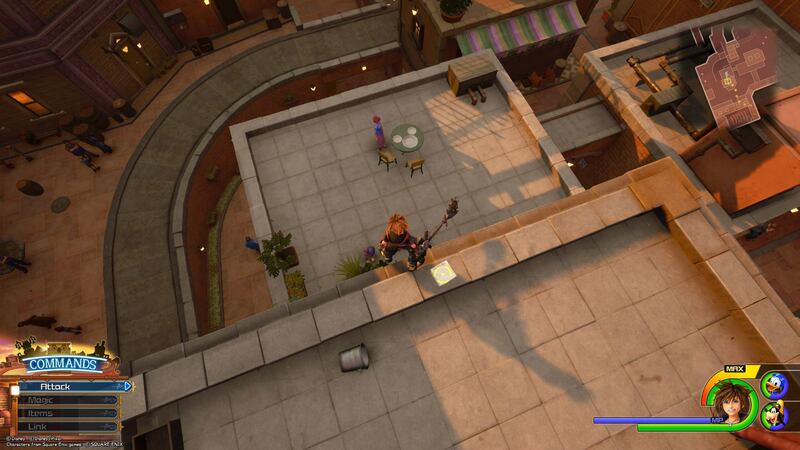 Jump onto its roof and you’ll find the Lucky Emblem on top. 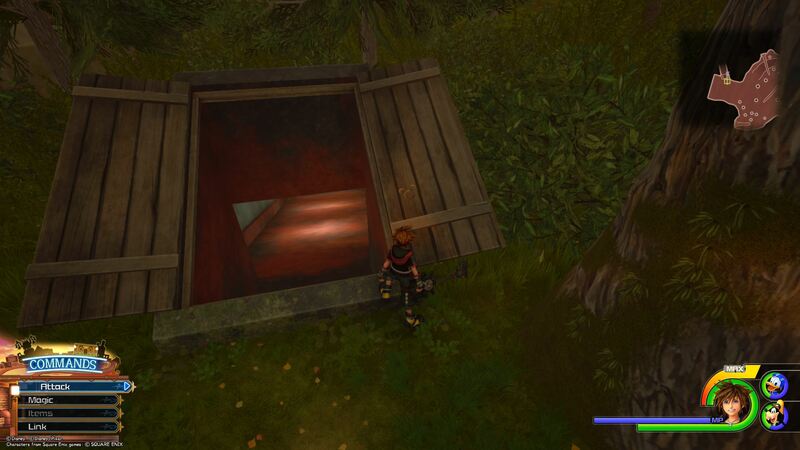 To reach The Old Mansion, you’ll travel through a series of underground tunnels. Once you exit the tunnels into the forest, turn around and look at the tunnel you just jumped out of. One of the two tunnel doors has the Lucky Emblem carved into the wood. Right after snapping a picture of Lucky Emblem No. 6, turn and climb the large stone and brick wall next to the tunnel’s exit. 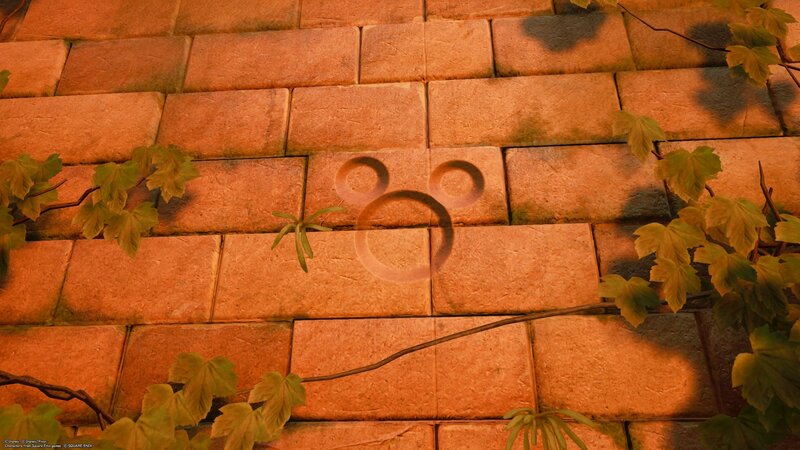 Once you reach the ledge, you’ll find the Lucky Emblem on the stone wall. As you make your way through the forest toward The Old Mansion, stick close to the outside edge of the area and you’ll eventually see a golden Lucky Emblem on the side of a small hill. This area is to the right of the main path, if you’re running from the Tram Common to The Old Mansion. 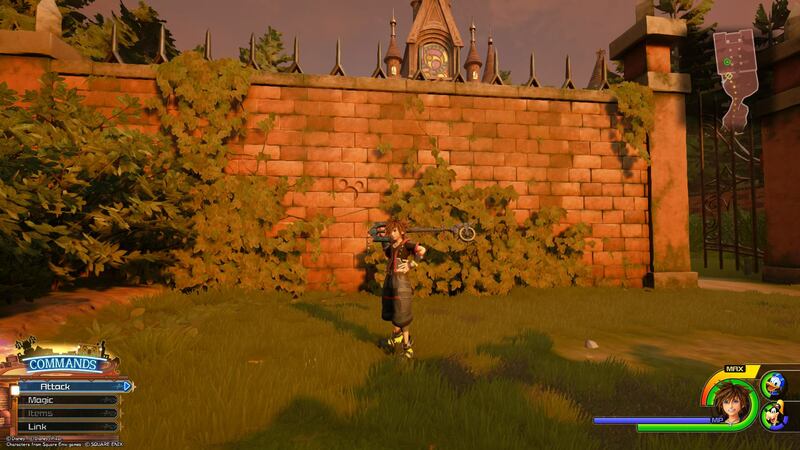 Once you reach The Old Mansion, the final Lucky Emblem in Twilight Town is carved into the brick wall to the left of the gate (before going through the gate). You’ll find it between two climbing vines.